Robert B. Haase’s public speaking career was temporarily derailed when he was told he would lose half of his tongue to save his life. On October 3, 2013, Robert had his 13th tongue cancer surgery, known as a "hemiglossectomy", removing the entire left half of his tongue. Robert is currently working on his upcoming book, Run Through the Fire. Robert is available for public speaking engagements and can be contacted by email or at his office: 360-918-8700. Hello again, my friends. I've got good news! my CT scan results came back from last week's scan and I continue to be cancer free! I cannot tell you what a relief that has been to me. A huge relief to my family as well. I will continue to be checked every three months for the foreseeable future with September 13th being my next scan. I really do not cherish those scans though. Since the oncologist wants to see everything clearly, I need to have an IV placed in my arm for delivery of a contrast agent that must be injected during the scan. The problem is, my veins are now stiffer and have thicker walls. They also have somehow found a way to hide when needles are near. I had a total of 21 "pokes" over the previous 3 CT scans. This time, I asked for one of the Group Health Urgent Care nurses to join me in the procedure room in search of a viable vein. Praise God! Just one "poke" and no pain. That made me happy all by itself, but being told, "You're cancer free", well... that was the week topper for me. Today was a huge day for me. I produced, promoted and spoke at my Business & Marketing Bootcamp seminar in Bellevue, Washington, and it went exceptionally well. I have to admit, I've been doing this for years, but back then I had a radio voice and didn't have a disfigured neck. I was worried how I would be received. Although I had helped out in two of my seminars a couple of months ago, my lead assistant, Charity Lisherness, carried the bulk of the load so that I could spend time going back to my hotel room to rest and sleep. I hadn't had to carry an all-day class since my surgery. Thank God I had three speakers that each spoke for a half-hour. Those 30-minute breaks were immensely helpful. But by the end of the day, I found myself using the tables towards the front of the room to covertly lean on to bolster my strength. It was a long day. 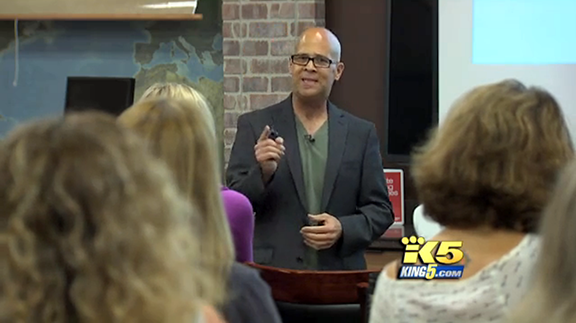 Before I started the class, though, Elisa Hahn, the reporter from King 5 News who did a story on me last October, (click here to watch the original story)*, had her videographer put a lapel microphone on me. Elisa wanted to do a follow up story on me and being that today was my official full day of me being back in the saddle, teaching a full day with my easily-fatigued tongue, Elisa wanted to be there, documenting not only the huge strides I have made in my recovery, but my first day back. My two youngest daughters, Sara and Holly, were able to be there at my class to assist me and Elisa was able to interview them both as well. The video of the follow up news story can be found HERE. Elisa really is a gifted story teller, able to capture a story on video while interviewing in a laid back way that puts you at ease immediately. She almost lulls you into forgetting that you are being recorded with the camera rolling. What my girls said made me proud and humbled. Sara's words about me "sticking around to walk her down the isle someday" filled my heart and made my eyes moist. It was Holly though, my youngest, whose words brought me to tears. We were both teary-eyed, but sadly, Holly's cherished words from her heart were "left on the editing room floor," as they say. That made me sad as I wish all of you could have heard every word they uttered from their hearts. My three girls are the biggest blessings of my lifetime. My parents and family have been a constant blessing to me in the uncertainty of this whole cancer journey, and I love each of them dearly. Even my parents who are in their 80's will drop everything to help me and be there for me. When I hear of the stories of families that hold onto the past, hold onto bitterness, resentment and are unforgiving of hurts, I feel for them. They are missing out on the blessings of forgiveness and letting go of our "right to be angry."